Sweet Dreams Hardcover Book by Cassie Byram. Save 85%. 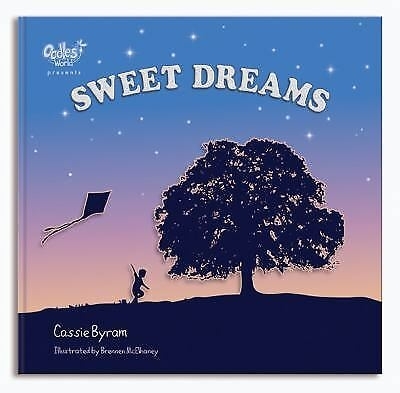 This hardbound companion book to the Sweet Dreams CD by Cassie Byram is the perfect bedtime book for children and their moms, dads and grandparents. Designed in a colorful scrapbooking style, each page brings a new surprise of shimmering images guaranteed to delight any preschooler. Parents everywhere know the eternal value of engaging young hearts with God's Word and Sweet Dreams does that in such an engaging way. Destined to become a family tradition, Sweet Dreams will help you create memories that will last a lifetime. "I am so excited about Sweet Dreams by Cassie Byram! If you have children, this is a must. But be forewarned, for it will be in your heart as well. Don't delay...get it right away." "<="" i=""> by Cassie Byram is a beautiful way to introduce children to the Word of God while they are at their youngest! The sweetly sung CD with the beautifully designed children's book is a winning combination sure to become a nightly tradition. Talk about the Ultimate Gift!" John 3:16: Jesus And Nicodemus In Jerusalem by Jim Reimann. Paperback. SAVE 83%. Jesus Is Alive! : The Empty Tomb in Jerusalem by Jim Reimann. Paperback. SAVE 83%. Make-A-Match: A Fun Bible Verse Memory Card Game. Save 75%. My Story of Jesus Happy Day Book Level 3 by Jennifer Holder. SAVE 50%.